The Sural nerve within the calf area (sura) is a sensory nerve of the leg. It is comprised of collateral divisions of the tibial nerve as well as common fibular nerve. Two cutaneous sections, the medial and lateral create the sural nerve. The lateral division emerges via the common fibular nerve and the medial cutaneous division emerges via the tibial nerve. When the common fibular nerve is divided through the sciatic nerve, it goes alongside the distal part of the biceps femoris muscle and to the fibular head. The tibial nerve and the common fibular nerve emerge as the sciatic nerve splits within two sections within the popliteal fossa. The small cutaneous section goes to the fibular head after it emerges as the common fibular nerve. The sural nerve is a cutaneous section of the tibial nerve that emerges high in the leg. 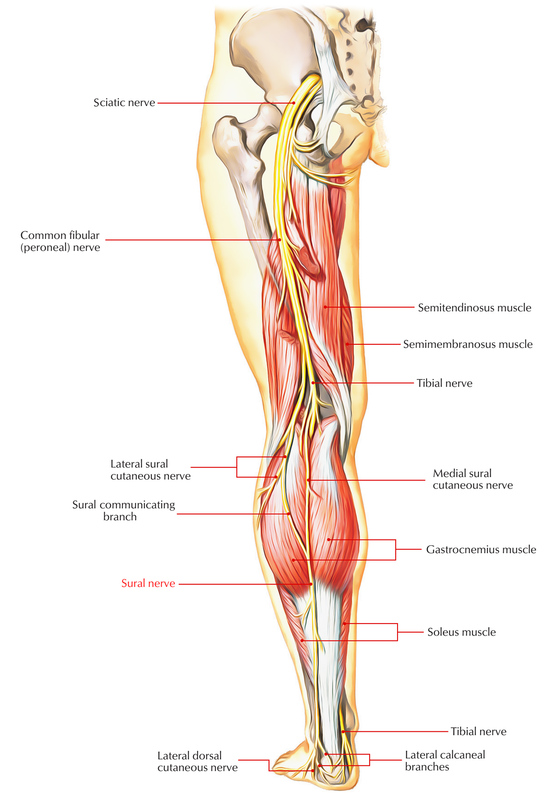 The sural nerve emerges high in the leg in between the two heads of the gastrocnemius muscle. Sometimes the two branches do not reconnect, when the medial sural cutaneous nerve is connected by the peroneal communicating nerve. The two sections of the sural nerve can emerge above the knee and prior to joining the peroneal communicating nerve, they may perforate the medial head of the gastrocnemius muscle. As the tibial nerve goes down the popliteal fossa, and earlier than it goes underneath the gastrocnemius, it produces a cutaneous branch which is the medial sural cutaneous nerve. This nerve travels laterally above the lateral head of the gastrocnemius. The common fibular nerve likewise produces a small cutaneous branch that is the lateral sural cutaneous nerve. Ending branches stimulate skin on dorsolateral side of the little toe and the lateral side of the foot. It goes into the foot in superficial fascia posterior towards the lateral malleolus near to the short saphenous vein. It comes down superficial to the belly of the gastrocnemius muscle and permeates through the deep fascia roughly between the legs where it is joined by a sural connecting branch from the common fibular nerve. It goes down the leg over the lateral malleolus, as well as within the foot. The nerve then proceeds down the leg on the posterior-lateral side, then posterior to the lateral malleolus where it goes deep towards the fibularis tendon sheath and connects with the lateral tuberosity of the fifth toe, where it separates. The sural nerve supplies skin at the lower posterolateral side of the leg as well as the lateral aspect of the foot and little toe. The sural nerve supplies the dorsal cutaneous area of the lateral 2 and half toes in some cases. It can end at the lateral border of the foot without supplying any digital sections. Due to the fact that this method needs couple of injections to achieve sufficient anesthesia, a smaller volume of anesthetic is required. A sural nerve block can be utilized for fast anesthetization to the foot and lower leg. The sural nerve is somewhat superficial, that makes it more available to surgeons, hence it is somewhat simpler compared to other treatments. In some cases inflammatory or vasculitic diseases include the sural nerve selectively. Additionally, the sural nerve will be associated with generalized peripheral sensory or sensorimotor neuropathy of any type. Sural mononeuropathy is unusual. It may be because of a mass sore like a ganglion or to trauma, which is one of the most common causes. Generally arising in the postero-lateral part of the leg and the dorso-lateral foot, still, sensory modifications from sural neuropathy vary. These can occasionally be agonizing along with paresthesias and dysesthesias.